Last Friday, Governor Jerry Brown announced the appointment of twelve California Superior Court Judges. Three of the appointments will be assigned to the Inland Empire. 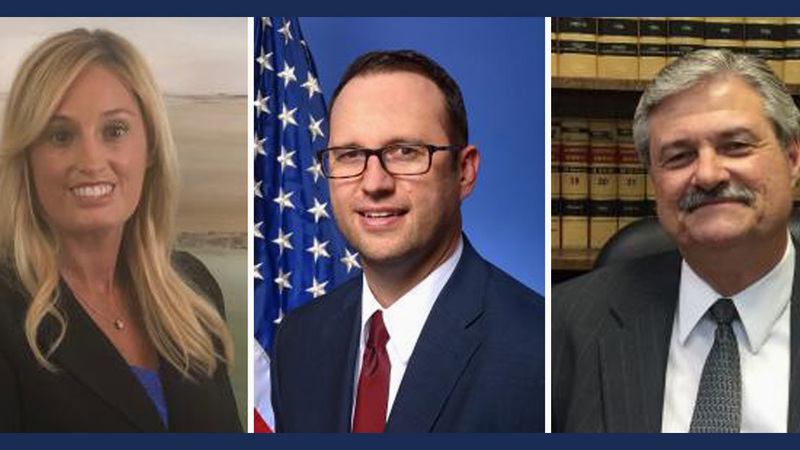 Jennifer R. Gerard and Timothy J. Hollenhorst were appointed to the Riverside County Superior Court and David E. Driscoll will be assigned to San Bernardino County. Gerard has served as a commissioner at the Riverside County Superior Court since 2017. She served as an attorney at the Riverside County Minors’ Counsel Panel and Adoption Panel from 2012 to 2017 and was a sole practitioner practicing family law and criminal defense from 2006 to 2017. Gerard also served as an attorney at the Los Angeles Criminal Appellate Project from 2010 to 2017 and a contract attorney at VMB Attorneys from 2013 to 2016. She was an attorney at the Juvenile Defense Panel from 2006 to 2013 and served as a deputy district attorney at the Riverside County District Attorney’s Office from 2003 to 2006. Gerard earned a Juris Doctor degree from the Western State University College of Law and Master of Arts and Bachelor of Arts degrees from Chapman University. She fills the vacancy created by the retirement of Judge Gloria C. Trask. Gerard is a Democrat. Hollenhorst, of Riverside, was named to an interim appointment for a judgeship in the Riverside County Superior Court. Hollenhorst has served as a deputy district attorney at the Riverside County District Attorney’s Office since 2004. He earned a Juris Doctor degree from the University of Kansas School of Law and a Bachelor of Arts degree from the University of California, Santa Barbara. Hollenhorst was elected in June 2018, to fill the vacancy created by the retirement of Judge James A. Cox. The Governor’s appointment allows him to immediately assume the position he was otherwise elected to begin in January 2019. Hollenhorst is registered without party preference. Driscoll, of Riverside, was appointed to a judgeship in the San Bernardino County Superior Court. He has been an associate at Berman, Berman, Berman, Schneider and Lowary since 2017 and served as a sole practitioner from 2004 to 2017. Driscoll was a partner and attorney at Driscoll and Reynolds from 1998 to 2004 and at Foster and Driscoll from 1991 to 1998. He was an associate at MacLachlan, Burford and Arias from 1986 to 1991 and at Pickell and Knudson from 1981 to 1986. He earned a Juris Doctor degree from the Western State University College of Law and an Associate of Applied Science degree from Barstow Community College. He fills the vacancy of a new position created on September 18, 2017. Like Gerard, Driscoll is also a Democrat. According to the governor’s office, the compensation for each of these positions is $200,042.